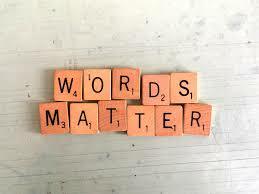 We did a partial “Words Matter” post many moons ago and we feel like folks need some clarify on some of the words we use in our posts and for the words that define actions. Clearing up the words to use for the action(s) could help our subscribers in moving forward toward their awesome life skills. We do care folks. The word “Intention”: When we say, “We send out our intentions to the Universe and forget about them.” It’s the same as praying to God and asking for God to send us something we think we need. Once we send the “intention” out we forget about it because we know that The Universe/God will get us the answer or comply with what we are requesting. It might be right away or might take some time. We might not be ready for the answer yet, but we know that God will only comply when we are ready. The wording of the “intention” matters and so does how our body feels. It’s all about mind, body, and spirit being in sync (Balance). If these three elements are not in balance, then we know that we choose to work on getting all in balance. This is part of our spiritual growth and we hope yours. When we speak of a “four body system” it refers to our physical body, emotional body, mental body, and spiritual body combined. The physical body is where the 12 Chakra’s reside, the emotional body is 8” – 10” away from the physical body, the mental body is 18” – 20” away from the physical body and the spiritual body envelops all around the other three bodies. Some may call it your “aura”. We choose to keep all four in sync by removing the negative energy and replacing it with Love energy all the way to the DNA of the Physical body. (This also applies to all your previous lives also). The wording of an intention: People create constantly with their moment-by-moment thoughts and feelings, their words and actions, and the internal dialogues in the mind every waking hour. People may say, I want the perfect body or marriage, but the thoughts and feelings they entertain most of the time do not support their desires. The words you choose are powerful, and you constantly reinforce their energy with your feelings. Yet the “words” do not match your feelings. You might say “I want more money”, but inside you feel poor. You might want to be involved in a better relationship, but inside you feel like you don’t deserve it and you are not willing to weed out the garden of your soul in order to attract that perfect mate. You might say “I want a perfect body”, but you do not love yourself. You do not love your body as it is, and you are not in acceptance of the lessons you are learning with your body n the present form. The way you use your words and how you feel will determine what you will receive as an answer. So friends, balance of everything will create a clear mind and then when your words go out in to the Universe, when the answer comes back you will see it. Note: From the send to receipt you choose to remain clear and what makes that happen if to be “in the moment”. Because you are constantly creating affirmations if you say “I am sick an tire of this and that” you are creating very powerful affirmations that return the energies you just mentioned. When the Universe hears that it give you what you want so you get more of the same. Post note: Most of the information in this post comes from a book named “The Seven Sacred Flames” by Aurelia Louise Jones and Mahatma I and II. Both of which we strongly suggest for a great read and awesome tips on how to accomplish getting a clear mind. Every word matters and where / who it comes from matters. If you are living in joy then your energy will be amazing to others, yet if you’re not quit there, then the energy will be not quite there. We did a post about “Fountain of Youth” and part of getting younger is the words you use communicating with others. Other will “feel” you age by feeling your energy. Go out and try the various feelings and see what response you get each time. The one thing we remember from a mentor many moons ago is “Have fun with all of this”. You decide how fast to grow and the harder you work will determine your growth, or maybe one day you will think “I wish to be enlightened now” and you will be in an instant. Remember everyone is perfect in God’s eyes. We have nothing else to report except to suggest going back to mother posts that have anything to do with “belief system” and our words that describe “how too”. Remember the “how too” is our energy at that time and because yours might be different then take what “feels good” to you and move on. This is something we have done in every book we have read,. Every lecture we have attended, every TV show we have watched, and every other tool we have received information about.